My name is Daniel and I am the creator of Artquake, a program within the global nonprofit ELLSSA. 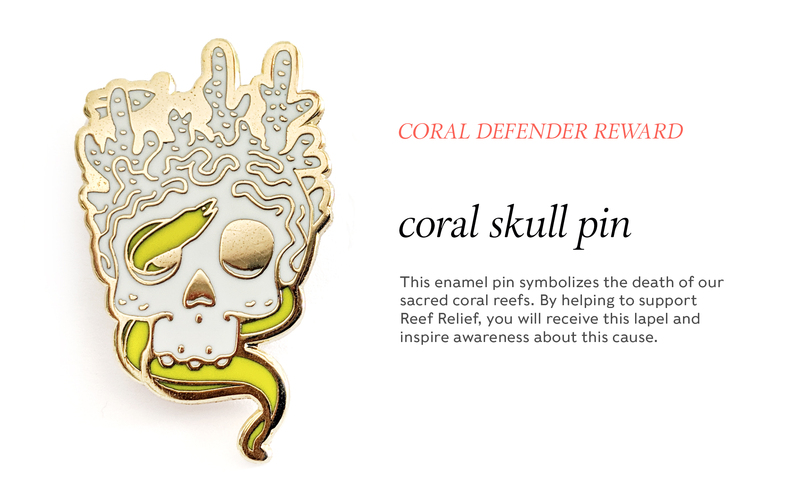 I have chosen Reef Relief as my spotlight project and I will be donating 100% of the proceeds to the Coral Reef Alliance (CORAL) for this project. I was born and raised on the island of O'ahu in Hawai'i. The ocean has been, and always will be, an integral part of my life. When I was just a baby, my father would take me to the beach at night to allow the calm choir of the waves to soothe me when nothing else would stop me from crying. When I was five years old, he would take me out to the tide pools around the island to search for seashells. And finally as I grew a little older, he would take me out to go snorkeling and diving where we would float above the coral reefs that cradled the island. Fish would weave in and out of their oceanic homes and I would hover above them admiring the different world that surrounded us. 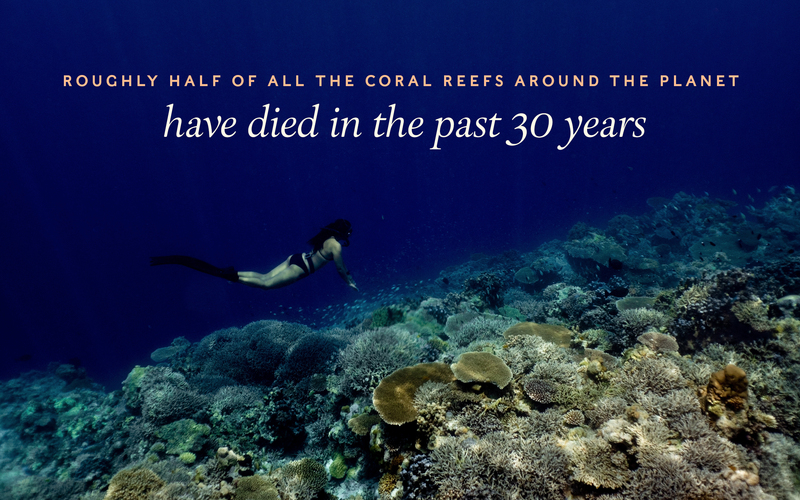 I would never have imagined that 20 years later, the same reefs I used to visit as a kid, are now dead. The array of colorful life in the water around my home has vanished. The same stresses that have killed off many of the coral reefs in Hawai'i have also demolished roughly half of all the coral reefs around the planet in the past 30 years. Coral is extremely sensitive to temperature change. They have a symbiotic relationship with algae which gives them the energy they need to survive and thrive. Just a 1 to 2 degree change in celsius can force the algae to expel itself, which is what causes the coral to become bleached. Bleached corals can repair themselves, but only if the water cools within a certain time frame. If high temperatures persist for months, the coral dies forever. 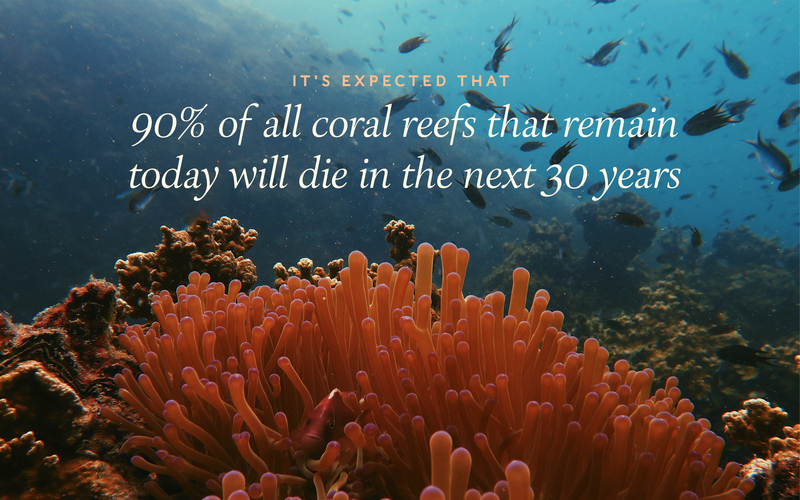 Coupled with over-fishing, pollution, unsustainable tourism and coastal development, it's expected that 90% of all coral reefs that remain today will die in the next 30 years. Coral reefs help produce the oxygen we breathe, they support life for over a quarter of marine species around the planet, support the lives of over half a billion people, and act as a barrier to protect from storms that hit coastlines around the world. The annual value provided by coral reefs to millions of people is estimated to be over $375 billion. I want to preserve what's left of our beautiful underwater world, and help save the coral reefs from perishing any further, so I came up with Reef Relief. Reef Relief is a project that aims to help rebuild our dying coral reefs and educate society about coral reefs, what's threatening them, and what we can do to help save them. I have partnered with Coral Reef Alliance (CORAL) who helps address the threats at a local and global level. At a local level, they reduce direct threats to reefs such as pollution, overfishing and unsustainable tourism. And at a global level, they help reefs by establishing adaptive reefscapes, which are networks of healthy reefs that enable corals to adapt to climate change. If you decide to support Reef Relief, your donations will first be used to produce your rewards. - A website will be paid for, created and maintained so that all of the sponsors can be displayed on it. It will also be a place donors can always visit for updated news and knowledge about the state of the coral reefs. - The pins and t-shirts will cost the most. We will be manufacturing hundreds of pins all of which will have quality card backings. 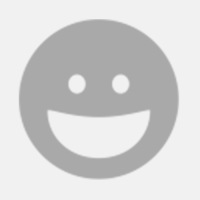 The cost of shipping each individual reward has also been incorporated into our funding goal. - The t-shirts are made by Royal Apparel. They are a leading organic and RPET (recycled plastic) clothing supplier. Each shirt costs around $20 for a blank shirt, and an additional cost to print the Coral Guardian designs on the shirts has been added to the final cost. The rewards will be made and shipped promptly upon completion. 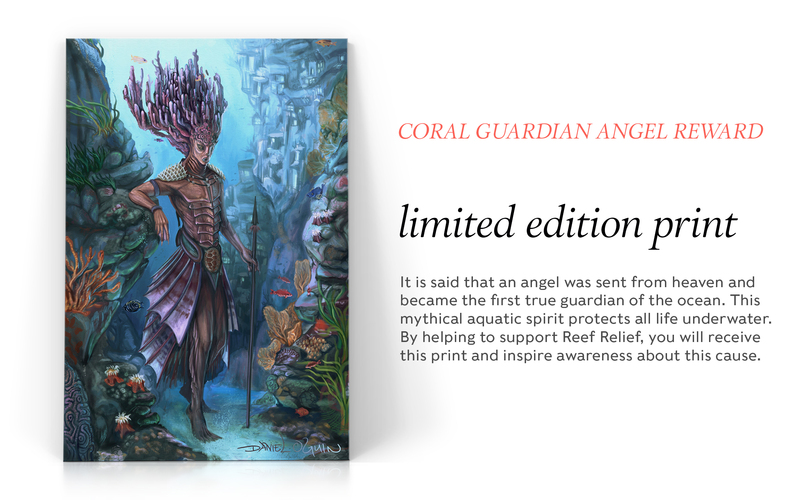 100% of the remaining proceeds will go directly to the Coral Reef Alliance (CORAL). CORAL works with fishermen, government leaders, divers and scientists to help establish healthy fisheries, marine protected areas and sustainable fishing policies. They also identify coral restoration techniques, protect habitats from destructive fishing practices, and strengthen coastal communities’ capacity to generate income from tourism in a way that protects coral reefs and supports local livelihoods. The more donors, the more we get to donate to CORAL! If we make our stretch goal, the donated funds will be used to create even more of the amazing rewards for our donors. 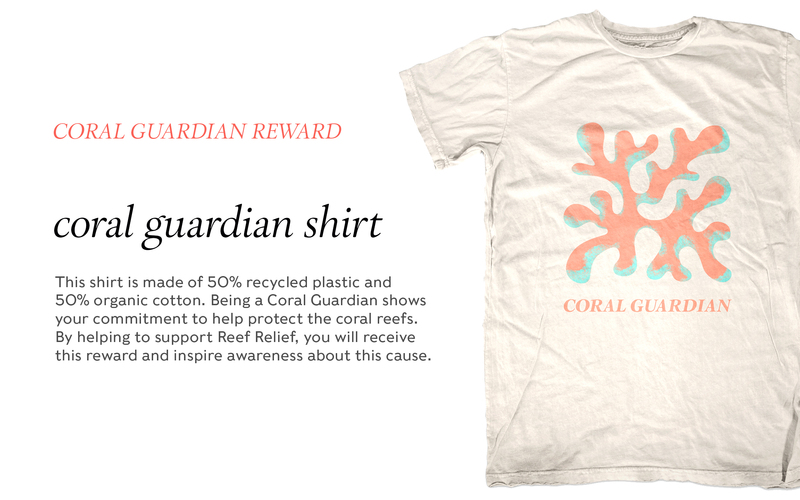 100% of the remaining proceeds will go directly to CORAL. The donation will help to assist them with everything mentioned in our funding goal, as well as many other tasks including monitoring water quality, building wastewater treatment infrastructures, and reducing sediment delivery to coastal waters which all help to protect the delicate balance of coral reef ecosystems. Want 100% of your proceeds to go to the cause, make a tax deductible donation!